In a young married couple’s life, the making of traditions is a big deal. It is done with excitement and trepidation. It is a time of new adventures and experiences. But enough of the sappy stuff. Let’s get right now down to it. For this particular Husband and Wife., it was to be the first Christmas spent quietly in their own home. They had planned and prepared for a different Christmas, hoping to make their own memories and traditions, while also knowing they would naturally miss all the family living far away. So, Husband and Wife began Christmas Eve day with much gusto. Christmas movies played throughout the entire day, the Christmas tree star was made, cookies were baked and given to the neighbors, frozen pizza & barbecue chips made a grand appearance as the long-awaited Eve arrived.The determined couple was doing pretty well. They had a Christmas-y day, filled with quiet Christmas-y things, as they made Christmas-y homemade memories. At 9:30 pm, Loving Husband turned to Nostalgic Wife and asked if she would like to look at Christmas lights. He wanted to make this Christmas Eve a good one and the evening was still somewhat young even though the day was well-spent! Nostalgic Wife agreed and looked forward to driving around the small little town for the Christmas lights. She just loved lights! Loving Husband prepared for the grand Christmas adventure. The heat wouldn’t work, so the windows didn’t defrost, so Nostalgic Wife prepared herself for an evening of admiring one Christmas lighted house—their own. And she was quite OK with that. But Loving Husband would not be deterred. Christmas lights, we will see! NO MATTER WHAT! So, now Husband and Wife are on their way. 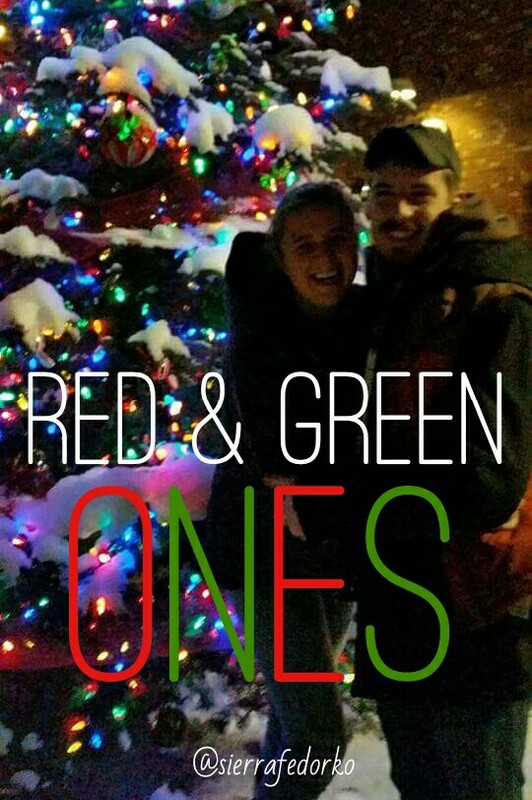 Being fairly new to the town, this particular Husband and Wife didn’t know where the good Christmas lights were and since it was later in the evening they didn’t feel liking driving the distance to a big city. So, Loving Husband stopped on the side of the road to check the Faithful Internet for good Christmas Lights. Nervous Husband and Not-Breathing Wife cross their fingers, drive extremely cautiously, and hope their suspicious park on the side of the road doesn’t give Police Car 1 reason enough to pull them over. The Police Car follows for a time and then (much to the relief of Husband and Wife) Police Car decides that this particular situation is not suspicious. Relieved Husband and Now-Breathing Wife get back to making Christmas-y memories on this first Christmas Eve as just the two of them. They go down main street, admire the beautiful festive lights, and then proceed to drive through the neighborhood. Persnickety Truck is doing well. Happy Dog is happy. And Husband and Wife are pleased. (Is this the same police car from before or is this a new one? I guess we will never know). Alert Husband notices he’s being tailed again. He wisely keeps this to himself while Clueless Wife is still enjoying the Christmas lights around her. “How nice to be making Christmas-y memories together on this Christmas Eve!,” she innocently thinks to herself. (How did she miss that Police Car 2 had been tailing them for the past few blocks? I guess we will never know). Isn’t it amazing how Clueless Wife can turn into to Freakazoid in a matter of half-seconds?! Her heart stops, and Happy Dog sticks that tongue out like nothing in the world could possibly go wrong. Enter red & blue lights. Enter pulling to the side of the road on Christmas Eve. There’s the shining flash-light. There’s the Wife still not breathing. There’s the Dog with that stupid tongue still hanging out. Theres the Husband still keeping calm. Calm Husband provides all the necessary information and explanations for the suspicious Persnickety Truck on Christmas Eve. Everything is confirmed. Nice Policeman is not suspicious of this young couple, and he even takes time to tell them where to find the really good Christmas lights. The information is naturally blocked out of their minds, because all they can think about is getting home with no more police cars in their rear view mirrors! When looking at lights around Christmastime, you want the red and green ones, not the red and blue ones.